UAMS celebrated the opening of the Walker Eye Surgical Simulation & Education Center on March 7. Pictured left to right: John P. Shock, M.D., JEI founding director; interim UAMS Chancellor Stephanie Gardner, Pharm..D, Ed.D. ; Mandy Macke, Walker Foundation associate director; Johnny Mike Walker, Walker Foundation trustee and son of Willard and Pat Walker; Nancy Shock; Terri Westfall; and Christopher T. Westfall, M.D., JEI director, interim UAMS College of Medicine dean, and director of its Department of Ophthalmology. March 8, 2018 | March 8, 2018 | A portion of the ninth floor at the University of Arkansas for Medical Sciences’ (UAMS) Harvey & Bernice Jones Eye Institute has been transformed into an instructive, collaborative center where ophthalmology residents and UAMS students can learn surgical techniques and procedures outside the confines of an operating room, thanks to a $600,000 donation from the Willard & Pat Walker Charitable Foundation. UAMS faculty, staff and supporters celebrated the opening of the Walker Eye Surgical Simulation & Education Center on March 7 with a dedication ceremony, complete with tours of the simulation center, classrooms and clinical space that comprises the renovated floor. Johnny Mike Walker, Walker Foundation trustee and son of Willard and Pat Walker, and Mandy Macke, foundation associate director, were in attendance. The Walker Center features simulation machines, microscopes and other equipment to help the next generation of ophthalmologists hone their skills. Under new curriculum requirements, ophthalmology resident physicians will have to show proficiency in certain surgical techniques and procedures, including suturing, cataract surgery and glaucoma surgery. The center will also be open to medical students and ophthalmic medical technology students. 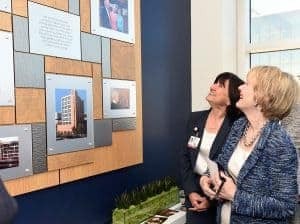 Interim UAMS Chancellor Stephanie Gardner, Pharm.D., Ed.D., and Nancy Shock, wife of John P. Shock, M.D., JEI founding director, share a laugh while viewing the new Walker Center placard on the newly renovated ninth floor of JEI. The ninth-floor revamp moves all simulation-related tools and equipment that were once scattered across multiple floors in the institute, to a centralized, modern space where residents can review surgeries on television screens and practice procedures. 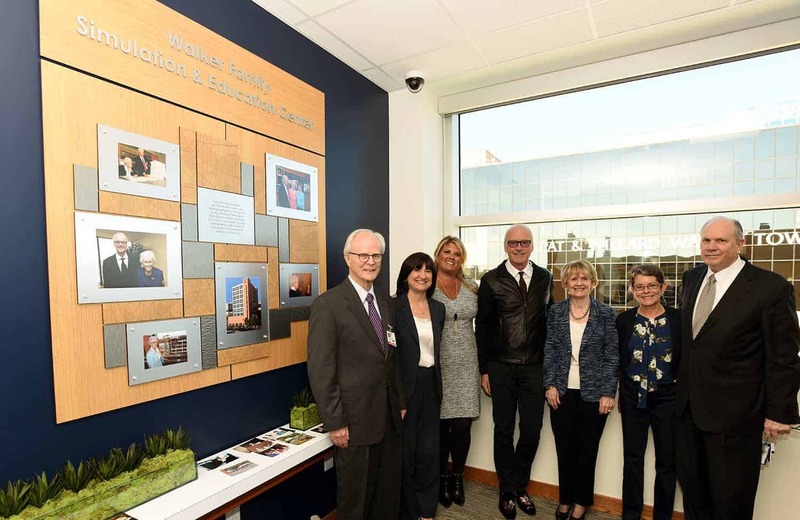 John P. Shock, M.D., Jones Eye Institute founding director, lauded the Walker family’s charitable giving and commended Johnny Mike Walker and Mandy Macke for carrying on the Walker Foundation’s philanthropic spirit. The center will be led by Ahmed Sallam, M.D., Ph.D., JEI ophthalmologist and assistant professor in the Department of Ophthalmology.